I only had one of Marlin's shifter knobs for more than a year and dealt with the Fail Gear knobs that came with their twin sticks but, no more. That's blasphemy putting Marlin equipment on a TG product. You had any problems with that twin-stick, I know three people that broke their's, one on the first trip!! I'm not having a problem with the Trail Gear twin sticks and if I ever do, I'll look for an alternative set up. I have those same twins. Been running them for about 10 years. 1st time out the rollpin broke. I disassembled and put new rollpin in in both sides. ZERO issues since. Not trying to stand up for TG, but that particular product once ever so slightly repaired is a good one. My next set up (r151 w/dual 2.28) will have a home brewed thripple stick set up i got from lizard lips. I have seen the fror but don't particularly care for the shifters turning out like they do. Is there a chance they started using a stronger roll pin? There is problems with twin stick idea in general. You are putting too much torque to one output and the twin stick design itself is weak. In general there is not much point in a twin stick, the only advantage a twin stick gives is going into 2wd low, how often does a person need to be in 2wd low? In the off chance that someone does need to be in 2wd low... put it in low and go unlock a hub. This would keep the torque equally to the front and rear outputs, as well as eliminate the issue of the shifters themselves. It also allows your shifters to only travel fwd and backward making for much nicer cuts in the floor and nicer shift boots. Keeps it more organized. I ran the FROR twin sticks for part of a Moab trip and for my one trip to the Round Up. 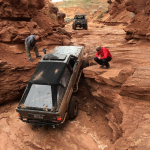 I had the Marlin Crawler Twin sticks in my truck and near the top of the Moab Rim trail the 2wd/4wd shifter folded over to the point that I really couldn't shift it anymore. I talked to Marlin Crawler pretty much on the spot and they overnighted a FROR replacement to me since their's were out of stock and the FROR was all they had laying around in the shop. It got me through the rest of the trip and then BigMike handed me a new Marlin Crawler shifter at the roundup. I opted to make the change at home and not take anything apart on the trail. The FROR twin stick was a solid unit, but it was too tall for my liking. I'd buy it over TG any day simply because of the branding, but I much prefer the Marlin Crawler shifter. The Marlin Crawler shifter broke because there was a small run of them that didn't get properly heat treated. I also got an adapter for my dual cases that was part of a small run that had been machined incorrectly. That once cost me two rebuilds before the issue was identified and due to the timing relative to a Moab trip and the adapters being out of stock is the reason that I actually have an Inchworm from case in front of my Marlin 4.70:1 rear case. I have a 2" BL so it may be that I haven't noticed any height issue. When I did twin sticks none existed so I had to make my own. I just got tired of waiting. It wasn't that hard and I short shifted it while I was at it. A little girder work followed by a little filing and a tad of welding and that's all it took. It's been years and it's still working just dandy. I think I used a mill on the aluminum spacer block for short shift but that could have been done on a drill press with maybe a little filing. I did have to take the shift fingers out to a heat treater to get them case hardened. Probably the hardest part was taking the transfer case apart to mod it for twin shift but that wasn't all that hard so I did a spare T case just in case and it's still laying around in the garage somewhere. Started by runner88 For Trade or Barter!